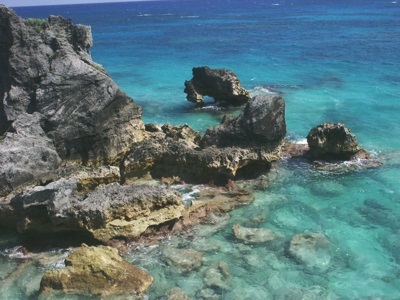 Bermuda (known officially as "The Bermuda Islands" or "The Somers Isles") is an archipeligo of about 138 islands in the North Atlantic. The islands, which lie about 640 miles (1,30 kilometers) off the coast of North Carolina in the United States, are a British Overseas Territory. The islands are small in area, covering a total of just 20.6 square miles (53.3 km2) but are fairly densely populated. 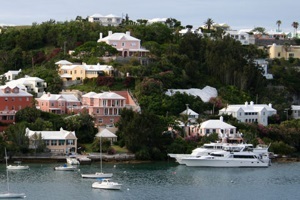 As of 2006, the estimated population of the islands was 65,773, including a substantial number of non-Bermudians, particularly people from the UK, the US, and Canada. 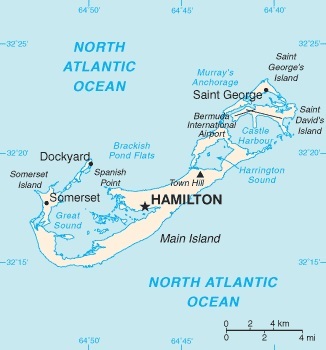 There are only two municipalities on the islands, Hamilton, which is the only city and is the capital and primarily financial center, and St. George's, which is the oldest permanent settlement on the islands and is known for its historic town. The Bermudan economy is a successful developed economy, based around financial services (it is an important offshore business center) and tourism, with around 500,000 tourists, mostly from the US, visiting the islands each year. The Bermudan currency is the Bermuda Dollar (BMD) which is pegged at a 1:1 ratio with the US Dollar. On the islands, both Bermudan and US currency are widely used, but banks will generally charge you if you wish to convert Bermudan Dollars to US Dollars. Written by locals, Fodor’s Bermuda is the perfect guidebook for those looking for insider tips to make the most out their visit to St. George, Hamilton, and beyond. Complete with detailed maps and concise descriptions, this Bermuda travel guide will help you plan your trip with ease. •UPDATED COVERAGE: This new edition features expanded beach coverage, with "Best For" rankings that help travelers choose the perfect beach. Fodor's writers have scoured the island to find the best new hotels, resorts, restaurants, bars, shops, and sights. •ULTIMATE EXPERIENCES GUIDE: A visually stunning color photo guide covers the essential sights and unmissable attractions throughout Bermuda. •GORGEOUS PHOTOS AND ILLUSTRATED FEATURES: Experience Bermuda culture like a local with selected features on its national drink (rum swizzle), national pastime (cricket), and a number of other cultural traditions and geographic features, including the mystery of the famous Bermuda Triangle and the allure of the country's favorite style―-Bermuda shorts! •INDISPENSABLE PLANNING TOOLS: A "Need to Know" feature offers travelers top-line planning information about the country as a whole. A Calendar of Events helps visitors choose the best time to plan a visit around special festivals, parades, and golf tournaments. Great Itineraries help travelers make the most of their island time. This guide also has useful tips for cruise travelers as well as folks planning Bermuda weddings and honeymoons. •COVERS: St. George, Hamilton, the Dockyard, the West End, the Parishes, pink beaches, Horseshoe Bay, Crystal Caves, the Bermuda Railway Trail, the Bermuda Aquarium, Museum & Zoo, the National Museum of Bermuda, Spittal Pond Nature Reserve, Front Street shopping, and much more. Planning on visiting other beach destinations? Check out Fodor’s Belize, Fodor’s Los Cabos, and Fodor’s Bahamas. This small mid-Atlantic island enjoys marvelous weather, the occasional hurricane, and a travel experience that is unsurpassed. This represents our fifth attempt to portray the island, with its narrow roads, picturesque towns, and secluded beaches. This is a doubled-sided map, enabling the island to be shown in excellent detail than any other map. Apart from roads, the map shows the route of the former railroad (now a cycling path), most of the hotels and guest houses, parks, schools, churches and, of course, historic sites and touristic attractions. Inset maps of Hamilton, the capital, and st. George, are included. Where to find the meals you'll most enjoy, from beachside shack to fine dining, and where to stay: from charming guesthouses that won't bust your budget, to the best resorts. Insightful commentary on Bermuda's history, architecture, local artists, and the island's flora and fauna.